Much of the talk heading into Saturday's clash between the Hamilton Tiger-Cats and Ottawa Redblacks was about Ottawa quarterback Henry Burris' return to face the team that cut him loose this past offseason, but the headlines afterwards were all about the other pivot. Dan LeFevour, who started the year as the Ticats' second-string quarterback behind Zach Collaros and didn't even get to start right away when Collaros went down (he was passed over for Jeremiah Masoli last week), turned in a remarkable showing in his first CFL start Saturday, throwing for 361 yards and a touchdown while rushing for 109 and another touchdown and leading Hamilton to a 33-23 win. There was more to this one than just the quarterbacks, of course, but LeFevour outdueled Burris, and that was a big part of why Hamilton managed to come out with a victory. What was impressive about LeFevour's play Saturday was his efficiency, especially in the passing game. His rushing ability is well-known, and led to him being frequently used in sub packages last year while Burris was Hamilton's primary quarterback, but although LeFevour threw for over 12,000 yards with the Central Michigan Chippewas in the NCAA (and ran for over 2,500 yards as well, the only player to record that combination), he hadn't thrown that many CFL passes before this game. This is his third year in the league, but he didn't record a single pass in 2012 and only completed 40 passes last season. LeFevour looked like an old CFL hand against the Redblacks, though, completing 21 of 30 passes (70 per cent) for 361 yards with a touchdown and an interception. He also showed off his mobility, collecting 109 yards and a touchdown on 13 carries (8.4 yards per carry) and frequently dodging rushers to throw impressive passes. Many of LeFevour's early passes were short to intermediate, but he got more comfortable as the night wore on and started chucking deeper balls. Overall, it was a remarkable showing from him, and one that made him the better quarterback on the night. Burris wasn't bad either, though. He threw for 290 yards and two touchdowns with just one interception, which was one of his better statistical showings with the Redblacks. He completed just 27 of 44 passes (61.4 per cent), so that could use some work, but a lot of that was about ongoing issues with Ottawa's receivers and line. Overall, though, this Redblacks' offence looked dangerous, and they proved much better at finishing drives this week than they were in even their 18-17 win over Toronto last week (where all their points came from Brett Maher going 6-for-6 on field goals). This team's still an expansion team, and they're still growing; if they can maintain this progress, they won't have a bad year at all. 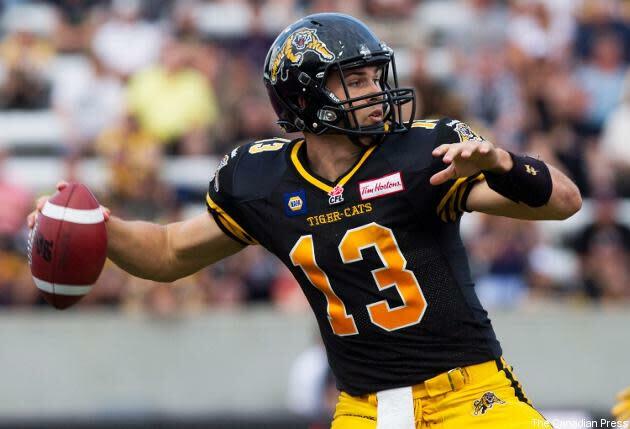 The Tiger-Cats wound up with the win, though, and that was critically important for them. They entered Saturday 0-3 and as the CFL's only team without a win, plus one that was outscored 69-41 to date. This was also their first regular-season game in Hamilton in 637 days (their home games last year were played in Guelph thanks to stadium construction), and it was a unique one, played at McMaster's Ron Joyce Stadium (capacity: 6,000) thanks to further construction delays. It turned out to be a great night for them, and one that might help them turn this season around. For that, they can thank LeFevour.